Observations: The LED was lit up. The negative charge from the battery was being transferred to the magnesium, and the positive charge to the copper via insulated wires with alligator clips. When the copper was rubbed on a paper towel, a reddish residue came off. The magnesium had a steady string of bubbles coming off of it. Next Day: The magnesium strip was much thinner. The copper had particles on it. The flower pot had white residue on the outside, and blue residue on the inside. Discussion: In this lab, we made a battery with magnesium sulfate, copper sulfate, magnesium, copper, and a flower pot. The LED that was connected to the metals lit up, indicating the presence of electricity. For electricity to be present, we need a closed circuit and a current. The negative electrons, traveled from the magnesium sulfate solution up the wire into the LED. However, they did not stop there. They traveled down the other wire into the copper. The copper was now negatively charged, and it attracted the copper particles from the copper sulfate solution. This was the residue that came off of the copper piece at the end. The charges were always trying to balance each other, which they were not able to do, thus creating a charge. The magnesium sulfate solution left a residue on the outside of the flower pot because it traveled through the flower pot via diffusion. The copper sulfate solution had the same reaction, but it went to the inside of the flower pot. 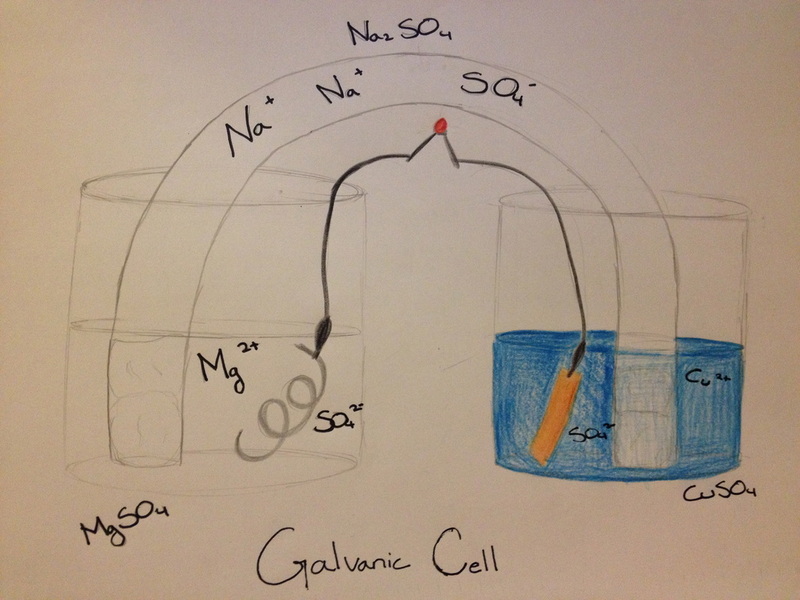 This battery can only die when there is no more magnesium, or when all of the Cu (aq) turns into Cu (s). Note: a positive charge is something with a lack of negative charges.